Brand: Toys R Us Inc. This recall involves 19,000 Koala Baby girl's plastic sandals with butterfly wings attached to the toes with rhinestones and hard or soft cork-type soles. Sandal colors include white or combination pink, gold and blue. They were sold in baby sizes 0 to 3 and girl's sizes 2 to 10. "Koala Baby" and the size are printed on the soles. White soft-soled sandals have model number GNL 43633BR and item number 795267 printed on a tag sewn into the sandal's ankle strap. 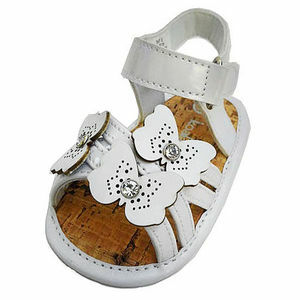 White hard-soled sandals have model number GNL 43706BR and item number 795313. Combination pink, gold and blue soft-soled sandals have model number GNL 43634BR and item number 795275. Combination pink, gold and blue hard-soled sandals have GNM 41761BR and item number 845795. Immediately take the recalled sandals away from young children and return the sandals to any Toys R Us or Babies R Us for a full refund. For more information call (800) 869-7787 or visit toysrus.com.